It’s been over a quarter-century since the fall of the Berlin Wall, but God has not returned to east Germany. Protestant churches, getting worried about the declining popularity of Christianity, have come up with a plan. Spiritual advising couldn’t bring people back, but maybe free Wi-Fi will. 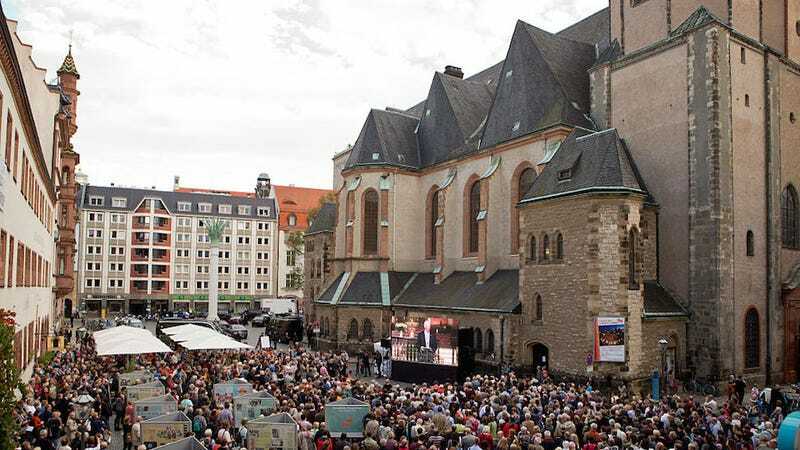 In honor of the 500th anniversary of Martin Luther’s Reformation, all churches in the former East Germany—starting with about 220 in Berlin, and rolling out to over 3,000 in total—will offer free Wi-Fi (“Godspots”) to guests. The hope is that it’ll show that churches aren’t just for sermons and bells, but also “a gathering place for communication,” says spokesperson Christoph Heil. The Reformation itself wouldn’t have happened without the printing press, so why can’t free internet have a similar effect? As a result, everyone is afraid to offer free WiFi, and the country has long been known as a “hotspot desert.” Even though a rule change means this will be loosened up in the fall—hopefully leading to more widespread Wi-Fi everywhere—the churches are pushing ahead now to show just how modern and useful they can be. If all goes as planned, the churches will be one of the largest Wi-Fi providers in Germany and, one would hope, bring at least some people back to the holy spirit. Good luck.